Thirsty Thursdays are back at the SAQ (ok they’re not officially called that) and I had a good enough window of time to be able to attend. 4 whiskys for 15$ even if you fall in a dud line-up it’s still a great way to expand your palate. By now even the casual whisky drinker will know of Auchentoshan’s triple distillation. Usually they will go on about how it’s more it an Irish thing to do, although I’ve come to learn that isn’t necessarily the case. It’s core expressions are usually affordable, making them a maintain of those top 10 lists, you know the ones, top 10 whiskys for beginners, top 10 gifts for fathers day under 75$. What is certain is that in its OB format ‘Toshan tends to be very polarizing, it’s a supple spirit that is often presented at anemic proofs and can be botoxed to excess by oak manipulation. This will be the first time I have an older version. It’s a mix of bourbon & sherry casks no specific vatting info. Nose: Pastry dough, or let’s make that cinnamon buns, apple, some guava. I get a good bit of the grain coming through, powdered sugar, a little latex. It’s pretty delicate, with time develops some fruitiness, jujubes. A smidge of pineapple. Palate: Milk chocolate, cashews, candlewax, raisins, I get a bit of sulfur, powdered ginger, lemon rind, there is a surprising amount if grip for 43%. Finish: light, grassy barley, a little bit if fruits but it suffers the most here, it loosens it’s hold fast, leaving little impression after you’ve swallowed. There are some nice aspects to this whisky, I like the attack on the palate, where the grain notes are holding their own against the sherry. Sadly the texture is so limp that the finish fails on the promise. One of the better versions I’ve had but still good, not great. As discussed in my previous review, the next two reviews are whiskys that were tasted blind as part of the same session. This is from a recent batch with the new livery and bottle shape. Deanston has been receiving a lot more attention of late. I believe that much like Bunnahabhain a few years ago owners Burns Stewart injected a good amount of capital in their operations. In order to implement a better cask management policy as well as diverting better quality casks to their OB’s rather than selling off a big proportion to brokers. This release is aged in ex-bourbon casks and then finished in virgin oak. Sadly little info exists about age and length of maturation. Nose: Starts of with a bit of pineapple, creamy yogurt & pears. There’s a sweet transition to Starburst candy & vanilla, rising pastries or bread dough. It’s pleasant and almost bourbon like until it moves towards a slightly green profile, almost like angelica or rhubarb. Palate: Sweet and slightly fizzy/nippy bite of alcohol, brown sugar, sultanas and loads of milk chocolate/cafe latte. There’s a smidge of tropical fruits, in the vein of rhum or Pina colada sitting in a base of sweetened porridge. Finish: malty, sweet and oaky a bit of a burn and that lingering milk chocolate. I took a shine to this whisky, it’s easygoing but has enough little twists to make it interesting, delivered at a proper abv too. In our little group this performed on par with a Benriach 15 which was the one “non-budget” whisky inserted in the group. I wanted to demonstrate how much of an impact blind tasting could have with our whisky club. The idea being to try 4 whiskys blind, 3 of them would be bottles purchased for 50$ or less and the 4th a Benriach 15 yrs old, which would be the outlier. No one knew what I was buying in advance. *Just a note concerning the color of this particular Scotch, it was like a washed out red that really immediately drew a lot of attention to itself. Perhaps the best blind tasting would also find a way to obscure the glass as well. Nose: Metallic, gumdrops, jam still hot from the stove, bay leaf. A herbal edge almost like vermouth,a bit sharp, rose jelly, powdered sugar. Palate: A bit hot,sweet and tannic at first, it veers sharply into malty territory, cooked barley and potatoes. The roller coaster continues into, boiled sweets, apple skins and then all sharp, green branches, grassy a little bit of blackcurrant. Finish: This persistent bitter note, like conifer or juniper, earthy, malty and a touch of jam. The finish is mercifully short and the texture very watery. Despite this being the worse scored of the night, it was actually not as terrible as I anticipated (I have had budget Glen Moray before) but that’s faint praise. It had some interesting things happening but was hampered by the thin texture and messy and unbalanced palate, like a bad cover-up. Even at 39$ CAN there are still better options for your whisky budget than this. I’m always impressed when I see photos of the tasting events put on by spirit companies. They run the gamut from low-key to lavish. 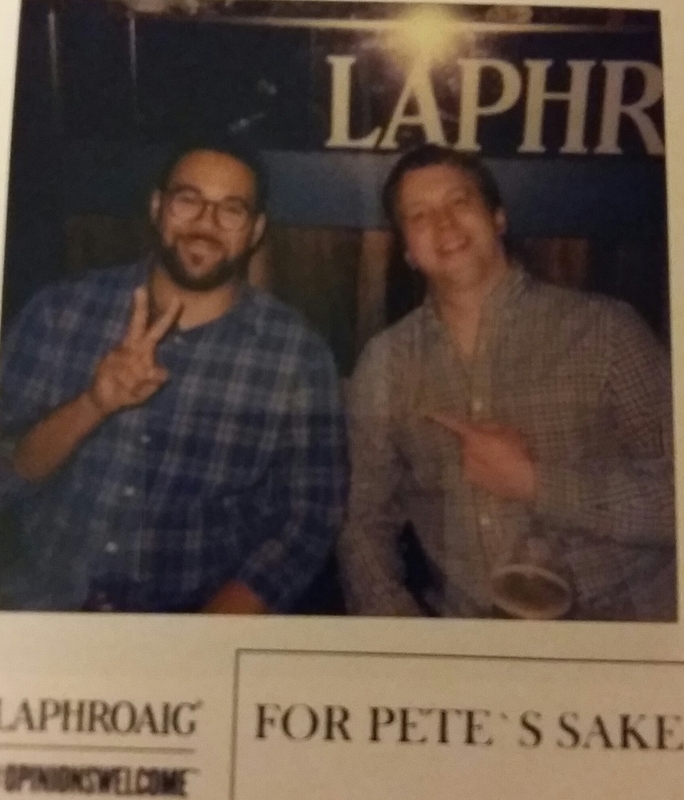 I promise I don’t turn green with envy when I see Tobi in one of his photo spreads balling out with the Ardbeg reps (I kid Mr. Barleymania). 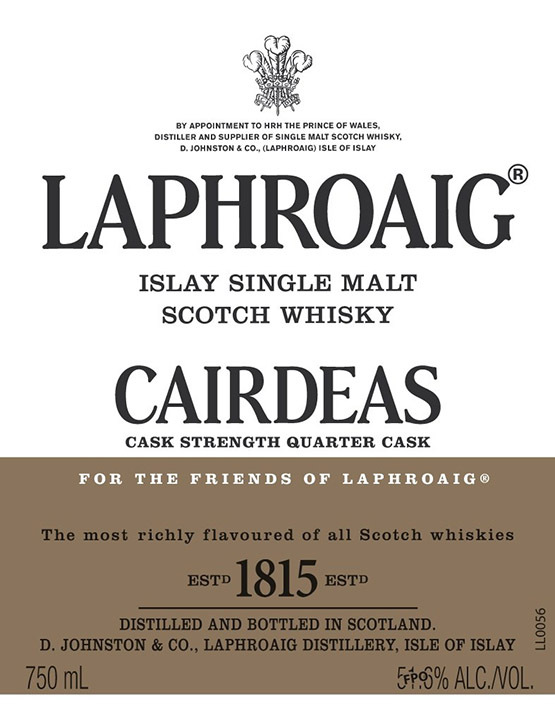 Well I can’t complain any longer, two weeks ago I noticed an email from Friends of Laphroaig inviting the Montreal members to a event. 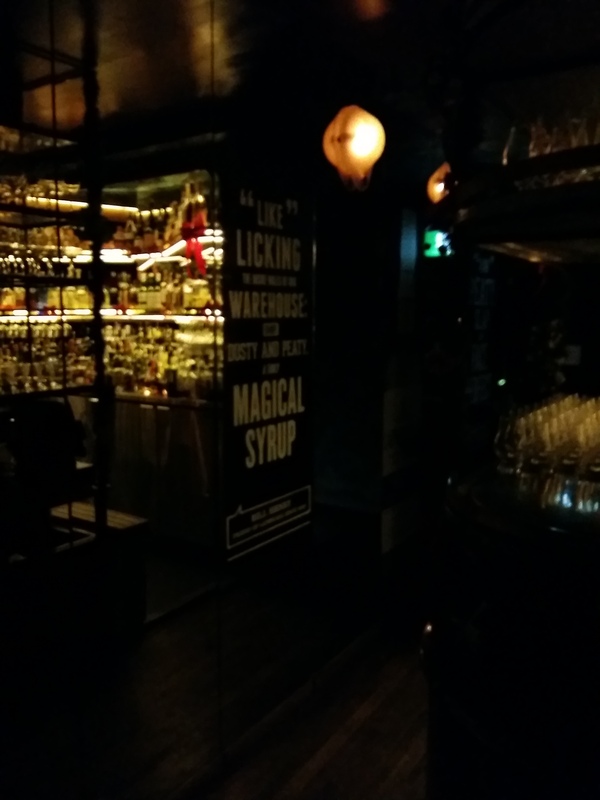 The chosen location turned out to be a cute little basement bar called “Le Royal”, the bars decor goes in for the speakeasy type vibe but it’s was nonetheless very nice. It had been decorated in Laphroaig’s current marketing swag for the event. 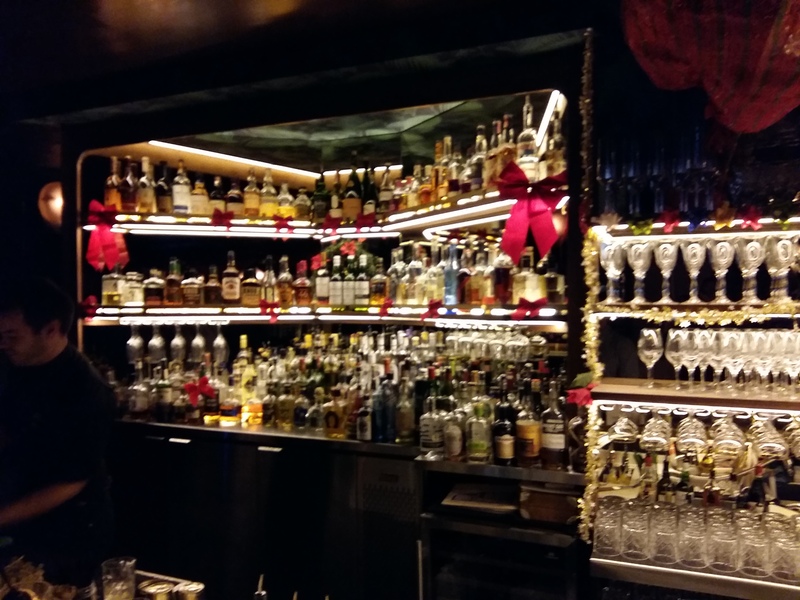 There were canapés aplenty (beef tataki, ceviche, foie gras macarons, parmesan crisps and more), we were offered two drink coupons as well. I was hoping they would be introducing a new expression or offering us tastes of the 2017 Cairdeas, sadly this would not be the case. 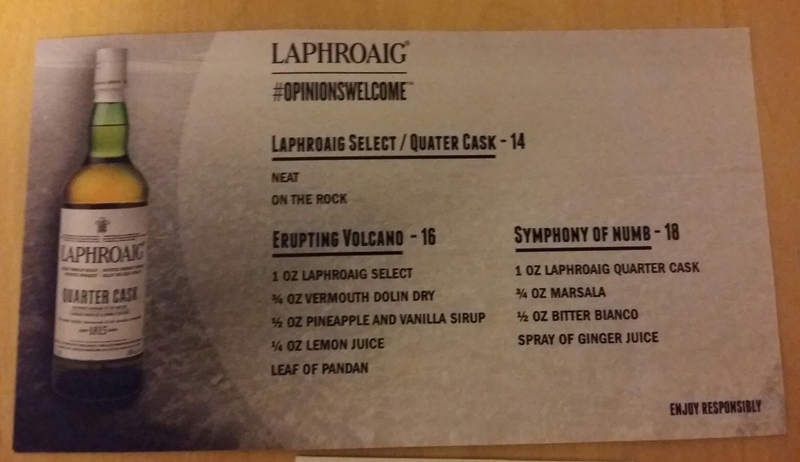 We were offered Laphroaig select or Quarter cask and also two cocktails created specifically from the event containing these same whiskys. I was joined by fellow EBWC member Brewsie and we opted to start with the “Symphony of numb” cocktail, the composition included ginger juice and Marsala and a healthy dose of Quarter cask seemed intriguing. Kudos to the bartender who told us he was the originator of the recipe and explained to us his creation. The cocktail managed to soften the attack of the whisky, the fortified wine being the initial flavor leading the way into the iodine and smoky burst that paired well with the spiciness of the ginger. We chatted with Sam one of the reps who was really friendly and offered us a sneaky taste of select (Laphroaig lite) and who was nice enough to introduce me to one of his fellows in marketing. I inquired about the status of the Cairdeas on our shelves. He confirmed it arrived at the SAQ warehouses but they have no control on when it hits the shelves, the price should be about 100$. If so it means the expression hasn’t experienced an increase in over 3 years, a rarity in the current market. With our tickets gone I offered Brewsie a dram for the road, I spied a bottle of Ardbeg 10 and thought it would be an interesting contrast since he had never tried it. Upon leaving we were presented with gift bags containing a Laphroaig Glencairn. It was a fun night it felt more like being invited to their office Christmas party than an actual event, since everyone was kind of left to their own devices. I can’t complain it was a much appreciated invitation. This summer took a long time to settle in, it made up for the delay by providing us with crushing humidity, hot nights and unpredictable storms that annoy more than provide respite. This heat has fueled my desire for something that I can crush and still have the willpower to do the dishes before going to bed…adult life *sigh*. I’ve started dipping my toes back into the beer scene since I’ve had a cracking few this winter (Harricana 138 call me, I can’t stop thinking about you). In order to add some variety I’ll throw in a few beer reviews. I am by no means an expert, my reviews are unlikely to make you swoon with anticipation and delight. 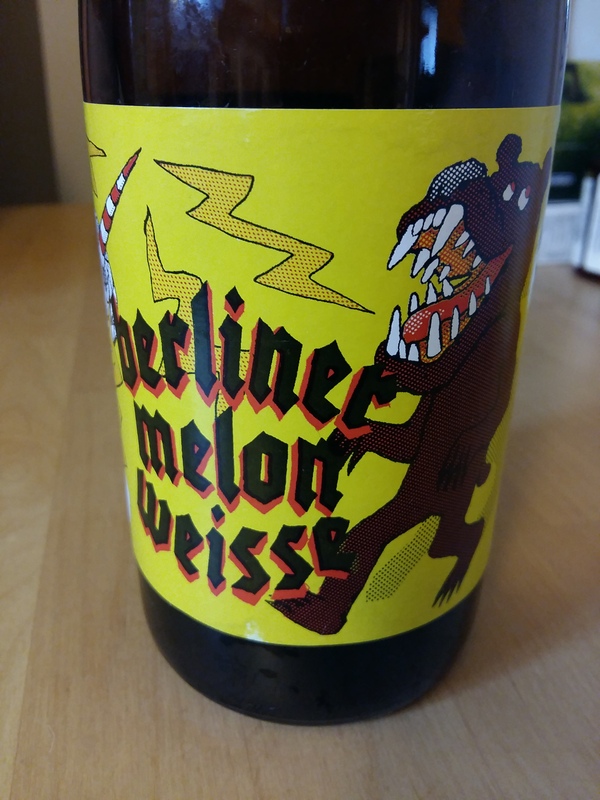 Enter Berliner Melon Weisse. 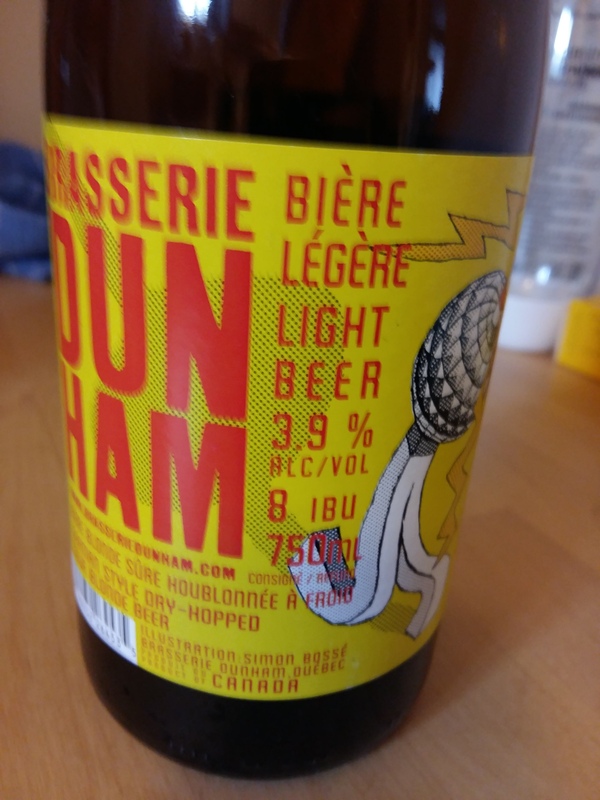 I was trolling some stores for the limited release of Dunham’s Berliner passion Weisse to no avail (after reading an empassionned review by Noah @ Beerism) but I did come across this funky yellow labeled stable mate and the price was right for this cheapskate that is 8$. The beer pours out with a light body, a bit cloudy but a pretty chunky foam. Nose: Immediately lemon, unripe melon, some hay and a mild amount of funk. The nose isn’t all that expressive. Palate: Oh that baby is sour, homemade OJ and lemonade, a bit of hoppy sharpness, I’m not getting much melon. It’s very dry and the finish drops off a cliff at the end. Infinitely refreshing, would probably make a good beer cocktail (ah sacrilege!) I dig some of these low alcohol beers. I want beer but I don’t want to feel like I ate an entire loaf of bread. My colleague Charles had the pleasure of visiting Scotland last summer. The nature of his trip did not allow him the leisure to do much whisky related tourism but while in Glasgow the opportunity arose and he headed to Glengoyne to soak in as much as he could (pun sadly intended). From his pictures it seemed to be quite the experience as he booked a warehouse tasting. I imbibed as vicariously as I could from his re-telling of this visit. He also generously offered a taste of some samples he brought back and his newly opened bottle of the cask strength release. Glengoyne is a distillery that doesn’t get much love although it seems the older expressions are well reviewed. I know at one time they exclusively used golden promise barley (much like Macallan) but there seems to be little emphasis on that lately and leads me to believe they might have abandoned that practice. They do natter on endlessly about being peanut free…wait oh they meant peat free… Ok well they also run their stills super slow I’m guessing it looks something like this maybe? The cask strength is unchillfiltered and uncoloured, it is purported to be a combination of 30% first fill and 70% refill sherry casks (a mix of American and Spanish oak). I have tried a few Glengoyne expressions before and it sometimes reminds me a little bit of Arran malt but with less of those nice funky and coastal notes. Nothing has bowled me over so far but I did enjoy the 15yr old which seemed to take really well to the proportion of sherried malt contained within. Nose: milk chocolate, dusty cumin, cooked barley and oats, quite a nip of alcohol, damp oak and a caramel made of Demerara sugar. It’s not very expressive at first. Palate: Glossettes, pepper, lots of oak and a slight touch of banana. Dried fruits and sherry sweetness give way to sulfur and a slight astringency and bite. The finish is long and drying, more raisins, the sweetness and black pepper lingers, there is less burn on the mouth than the nose but that bitterness starts to build up after a while. There isn’t a lot of variety to this dram it finds it’s s groove and sticks to it. It’s not a contender for the usual big muscled sherry bombs, it doesn’t have the fruits and oaky punch of A’bunadh for example. Ok another Thursday, another tasting session at the SAQ, this time around the focus would be on world whisky. The line-up would consist of 1 whisky from Glenora in Canada, 2 Breton single malts from Distillerie Warenghem and lastly some good old sourced American rye from MGP by way of High West…let’s go! Glen Breton Ice: This is a 10 year old single malt from Canada’s Glenora distillery, it’s finished (or aged sources differ) in icewine casks from Jost Vineyards…there seems to be different versions of this, 10,14 & 17 years old and some at cask strength, this is the 40%. Nose: soapy, sour, wet wood, sharp, violets?? it’s not very expressive. Palate: Bitter, oaky astringence, the texture is so watery it washes away from your tongue so fast. The finish has a slight, lychee and plum feel but it’s so faded and it’s too late to rescue this malt. Next Armorik is produced by Distillerie Warenghem in Britanny. They are some of the few French whisky producers who actually use Scottish style pot stills (made in Italy actually) rather than the Cognac style stills that many other houses use. They have been around for a while and in the last few years have really improved the quality and types of casks used. They have also gone against the current trends and gone completely unpeated, which I think they we’re using the first few years..my hopes are high. Armorik Sherry Finish: 46%ABV NAS, Initial unknown ageing in ex-bourbon casks and then finished in Oloroso Sherry casks no mention of how long. Nose: Sharp, lactic/acetone tang, cumin, wormwood, brown raisins, a bit of melting brown sugar. With water the nose opens up , you get more dark dried fruits and leather a bit, the alchohol vapour recedes. Palate: Bitter, oak overload, the alcohol dominates, ginger, barley, grain alcohol. With water the palate is…worse! Grainy, bitter herbs, burnt spices, splenda or artificial sweetener…agh! I’ve never had the palate of a whisky get so violent with water…I’m speechless. Armorik Double Maturation: 46% ABV, non chill filtered and NAS, first aged for an unspecified period of time in new Breton oak casks and then secondary maturation in Sherry casks. Palate: Rye, caraway,dill then red licorice, lacto-fermented vegetables, toffee, red pepper, Thrills chewing gum…the one that tastes like soap, coriander seeds. Sweet, oaky and a bit waxy but not cloying. Oh I really like this. Verdict, this sessions was bust also in a way really fun, some would say i’m a masochist…yes but I also feel that it’s good to have these train wreck of a session, it really helps you re-set your gauge. There is a lot of average whisky out there but when you get something truly mediocre, it helps you re-align yourself. It allows you to become more in tune to how whisky is constructed and appreciate a truly outstanding malt. For what it’s worth that High west rye would have stood out among a strong roster of whiskies as well. For the 3 readers of my blog if you are in Montreal (I just cut that down to 1 reader…hi mom!) the SAQ Signature branch is sadly closing it’s doors on April 15th 2017, inventory and services will be split among the Atwater market and Maisonneuve (city concillors) locations. I believe the new Signature downtown location is being build but won’t be ready until next year…or the following this is Québec after all.